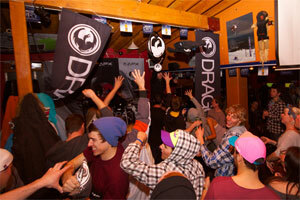 Dragon held their Big Air after party at Falls Creek recently and shot through a bunch of photos from the night… There’s girls kissing girls, dudes kissing dudes and some guy kissing a beach ball. There was obviously a lot of love. Some of our favorite peeps were in attendance too. Check the photos from the night above.